Beach Themed Wedding – add sea shells to your flower girl dresses! June 7, 2011 / Aqua Themed Weddings, Beach Weddings, Destination Weddings / Comments Off on Beach Themed Wedding – add sea shells to your flower girl dresses! 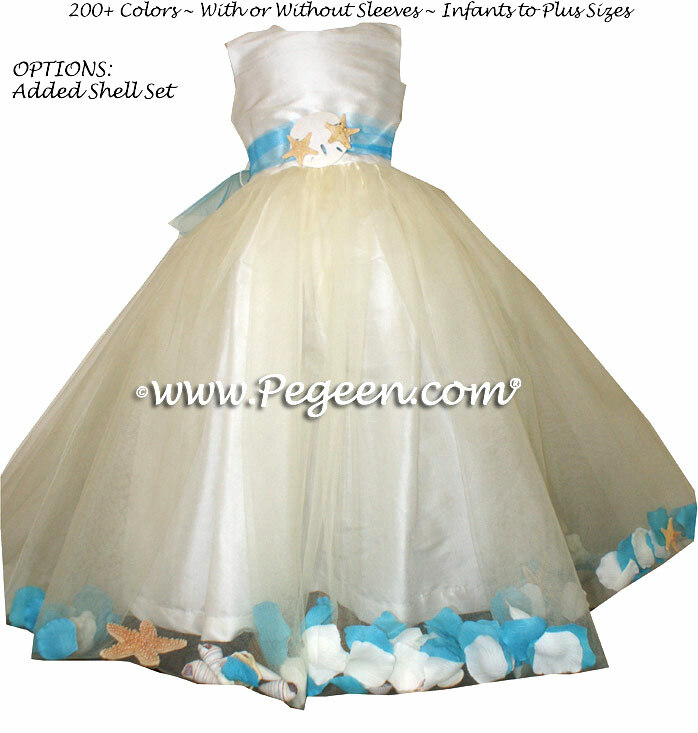 Beach Themed Weddings – add shells in your flower girl dresses! THIS CUSTOMER CHOSE TO BASE HER FLOWER GIRL DRESSES ON STYLE 333 WANTING SEA SHELLS IN THE SKIRT – it was an additional $25 for us to gather shells from our favorite Sand Beach in Florida for HER FLOWER GIRL DRESSES. Picked from the shell beaches of the Gulf Shore. SKIRT AND SILK SASH IN NEW IVORY WITH REAL FLORIDA SHELLS AND STARFISHES! WE TRIMMED IT WITH TURQUOISE TULLE FOR THE SASH AND THE SHELL PACKET. The front of the dress was trimmed with a sand dollar and two more starfishes…. and of course silk petals. My kids love it when we go to their favorite shell beach just south west of Naples FL and load up for the season. With shells however, you have to air them out and dry them in the sun to reduce the smell. One of our favorite Flower Girl Dresses of the Year! California Wedding Wave has featured Pegeen.com in their blog. The publishers of Ceremony Magazine has created California’s most comprehensive wedding planning, bridal blogging, social surfing site: California Wedding Wave. In March, Pegeen announced our Flower Girl Dress and Wedding of the Year which HAPPENED to be also featured in Ceremony Magazine and their blog as well. We are honored to kick off our newly revised blog with such beautiful photography by Marianne Lozano Photography. Style 402 is a Degas-Inspired flower girl dress and was created for our client, Jenny, in pale blush pink and bisque. It has layers and layers of tulle to inspire any ballerina like arabesques in your flower girl. Her dress is made from 100% Silk.